The enthronement of the new Bishop of the Metropolitanate of Australia and New Zealand Serbian Orthodox Church, took place at the St George Cathedral in Cabramatta, Sydney, on Saturday, 22 October 2016. His Grace Bishop Siluan Mrakic was enthroned as the new Bishop of the Metropolitanate of Australia and New Zealand. The Divine Liturgy was led by the new Bishop Siluan, who was assisted in service by His Grace Bishop Longin of the New Gracanica and Midwestern American Diocese, His Grace Apollonian Bishop Serafim (local Archdiocese Vicar of the Constantinople Patriarchate), His Grace Bishop George of Canberra (vicar of the local eparchy of the Russian church abroad), numerous priests from Serbian and Russian churches, including the Moscow Patriarchate jurisdiction in Australia, as well as guests from Serbia and the Republic of Serpska. 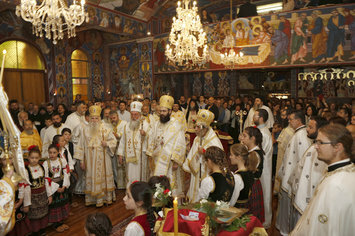 The Divine Liturgy and the celebratory lunch, which included a special program, were attended by numerous representatives from the Serbian community across Australia and New Zealand, as well as the Consul General Mr. Branko Radosevic and Ambassador Mr. Miroljub Petrovic, who addressed the guests during lunch. Political representatives in attendance included members of Federal Parliament, Mr. Craig Kelly MP and his associates Mr. Chris Hayes MP. On Sunday, 23/10/2016, a commemorative ceremony was held in Dapto near Wollongong, marking 30 years since the completion of construction and consecration of the church of St. John (Sv. Jovan). On this occasion, the Liturgy was served for the first time by Bishop Silvanus as the new Bishop.